Preheat the oven to 400˚. Drain the artichokes, rinse well and cut them into quarters. Pat dry with paper towels and place on a parchment-lined baking sheet. Toss the artichokes with the lemon juice, 1 tablespoon of the oil, and minced garlic; bake until edges begin to crisp, about 15 to 20 minutes. Meanwhile, bring a large pot of salted water to a boil and cook pasta until al dente, according to package directions. Drain the pasta and drizzle with 1 tablespoon of the oil. Shake strainer a few times to distribute the oil and let steam escape. Set aside to cool. Heat a heavy skillet or cast iron pan over medium-high heat. Add the remaining tablespoon olive oil and the asparagus pieces. Cook asparagus until just crisp-tender, about 4 minutes, stirring often. Place in a bowl to cool. 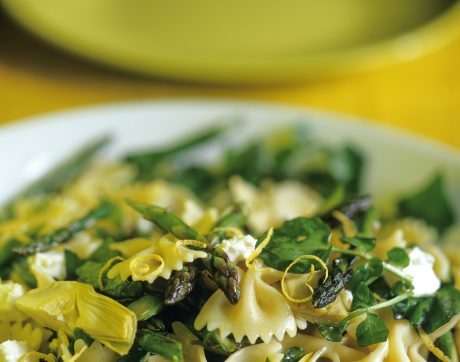 When the pasta and asparagus are cool, combine them with the watercress or parsley in a large bowl. To make the dressing, in a small bowl, whisk together the lemon zest, lemon juice and oil. Season with salt and pepper. Just before serving, add dressing to the pasta and mix. Stir in the artichokes, gently fold in the feta, and transfer the salad to a serving dish.